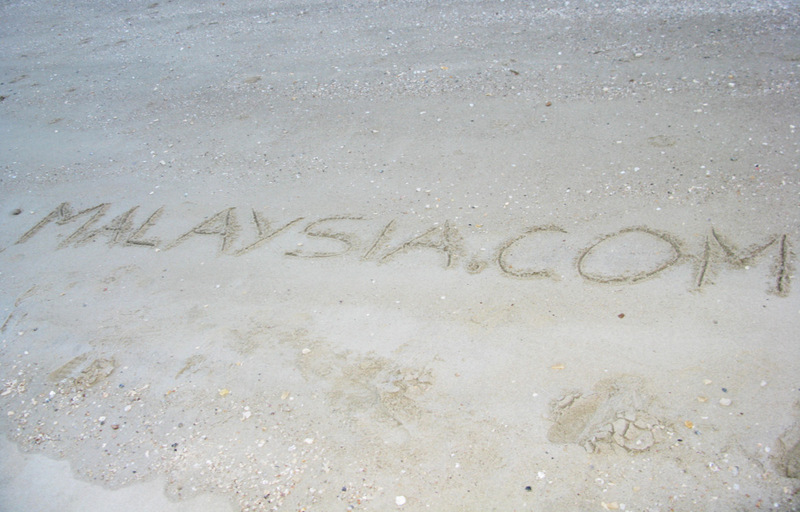 Langkawi’s many islands are ringed with countless stretches of beach. Some have white sand, some have golden. Some are hotspots for watersports, some are secluded getaways. Some are located along the most luxurious resorts imaginable, others appeal to backpackers on a budget. We couldn’t hope to experience anything resembling a representative sample of the full scope of Langkawi’s beach life in a single afternoon, so we made the decision to check out two very different beaches: the popular Pantai Cenang strip, and the serene Pantai Kok. Pantai Cenang is lined with dozens of restaurants, with most offering seafood freshly caught from Langkawi’s waters. Shops offer everything from trinkets and souvenirs, to sandals and swimsuits (for those who forgot their own at home). Most of the resorts sit right on the shore, allowing vacationers to walk straight from their rooms right onto the white sand. We noticed plenty of families at Pantai Cenang, with children splashing in the blue waters while parents relaxed under palm trees. Stalls sold drinks and rented out equipment for the more adventurous – we saw plenty of people jet skiing and a few trying their hands at parasailing – with mixed results. 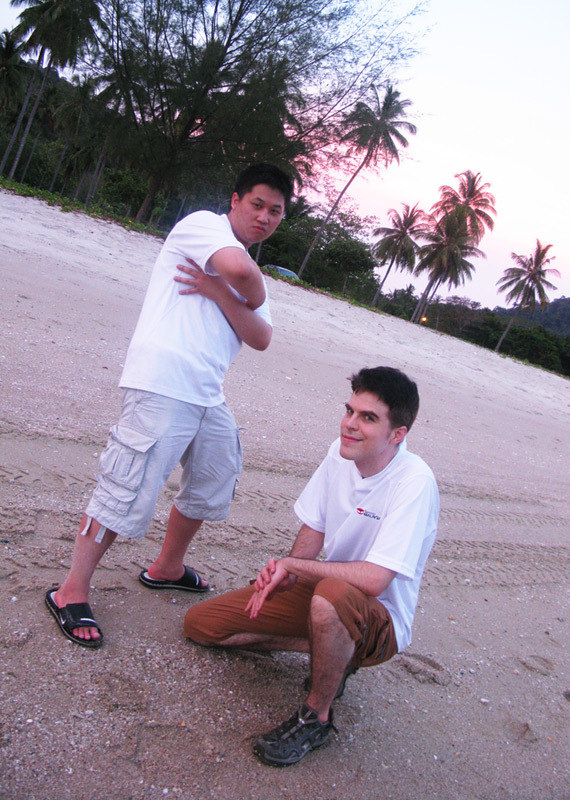 The sun was starting to go down and so we headed for Pantai Kok on the northwest coast of Langkawi. There was barely anyone about, just a few couples slowly walking along the sand as the water gently lapped against it. We’d planned on eating the market food back at the resort, but the scene at Pantai Kok, with its calm waters and wide open sky, was too tranquil and relaxing to pass up. We decided to have a picnic on the beach and watch the sun set. We had a feast of bihun (fried noodles with veggies), char kway teow (noodles, chili puti and bean sprouts), nasi kandar (curried chicken on rice), murtabak (meat, curry and cabbage rolled in a light pastry) and putu mayang (rice flour pressed into fine threads and eaten with shredded coconut and brown sugar) and soft tofu with gula mulaka (the palm sugar syrup we’d slowly been growing accustomed to) for dessert. Ian liked the savory flavour of the murtabak the best, while I, being a sucker for anything with coconut, was particularly taken with the puta mayang. 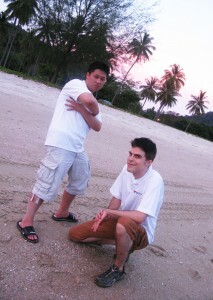 Reppin' Vancouver on Pantai Kok. Brand exposure in the key fiddler-crab demographic. 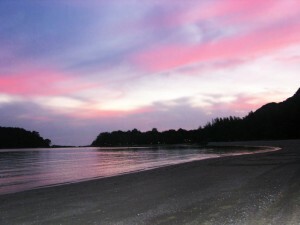 Looks like my next trip will be the Pantai Cenang beach. 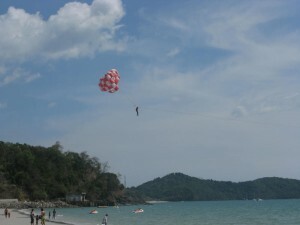 I have been to Langkawi many times but never know there is such a beautiful spot.